For some companies, the annual holiday party can be characterized by four words: “More of the same.” Some organizations get caught in a rut of having the same party at the same venue with the same practices like “Secret Santa.” If you’re looking for something fresh and exciting this holiday season, we know a great way to start! Host your annual holiday party or corporate event with Skyline Cruises. Our 3-deck luxury yacht, the Skyline Princess, offers a distinctly unique setting for your holiday event. What makes Skyline Cruises unique? We’re successfully wrapping up our 25th season as New York City’s best floating event venue. 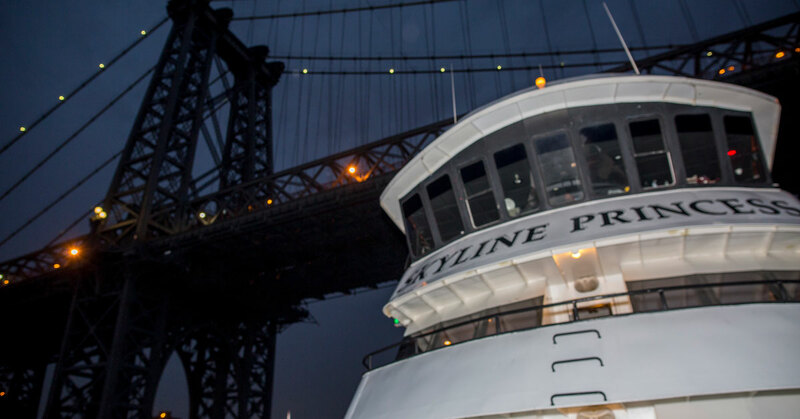 While aboard the Skyline Princess, you’ll view iconic landmarks of the greatest city in the world, including the Empire State Building, Brooklyn Bridge, Ellis Island, and the Statue of Liberty, plus the famed New York City skyline itself. All of them provide a magnificent background for once-in-a-lifetime photos. Our spacious yacht is climate controlled so don’t worry about weather-induced postponements. Do you have a large crowd? The Skyline Princess is Coast Guard approved to carry up to 450 passengers. Instead of a traditional gift swap, add a fun theme like gag gifts or an ornament exchange. Have attendees bake or buy their favorite holiday cookie and allow guests to sample a variety. Provide customized boxes for them to take them home. Add a fun theme to your event. Ugly sweater day has become a popular choice in recent years. Instead of a party, create a charity fundraiser and donate to a charity that’s close to your employees’ hearts. When you host an event aboard the Skyline Princes, you’ll have access to its three decks, all of which have viewing decks to give you spectacular views and photo opportunities. The lower decks can serve as a dining area or as a charity auction space. Our top deck, known as the Skylight Deck, is ideal for the actual celebration. For entertainment, we have a dance floor and DJ space. Skyline Cruises offers a variety of delicious menu options that are freshly prepared by our own chefs. The staff at Skyline will work with you to make your corporate event just what you envision. The Skyline Princess doesn’t just host corporate events. We can host whatever event you’re planning. We specialize in weddings, bar/bat mitzvahs, birthdays and anniversaries, and school events including reunions or proms. If you’re considering a full ship charter, we can depart from our home port at the World’s Fair Marina in Queens or other ports on Long Island, New Jersey, Connecticut, or Westchester. If you’re hosting a smaller event, consider booking a private deck on a public dinner cruise. We can even set aside a table or two for intimate celebrations. No matter what your event is, Skyline Cruises will help make it unforgettable. Contact us today at 718-446-1100.